The original etching Our Earth (1936, 15.6 x 12.4 cm) was published in 1937 in an edition of 225, the largest edition illustrated with an original etching by Norman. The etching evokes an image of great beauty and contrasts it with the callous discord of mechanisation as McKenzie described. 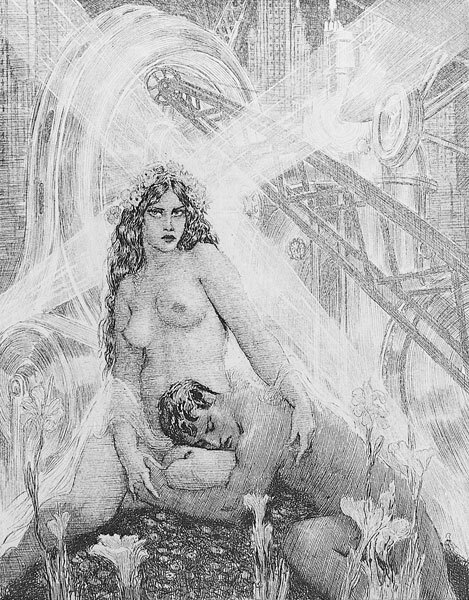 Our Earth and Creative Effort is a new Norman Lindsay Facsimile Etching Folio set released in 2008, the folio contains, as well as the two Facsimile Etchings, a brochure with details of the two books – Creative Effort and Our Earth in which the original etchings of the same titles, Creative Effort and Our Earth, are included and also the essay ‘The Craft of Etching’ by Norman Lindsay. Kenneth Mackenzie’s ‘Our Earth’, a long blank-verse poem, is simultaneously a celebration of the natural beauty and bounty of the Earth and a protest against its corruption by man and machine. The Earth’s seasons – the seeding of spring, maturing of summer, harvest of autumn and winter sleep – are at one with Earth’s inhabitants. The cycle of life – conception, gestation, birth and death – are the seasons of man. The 1930s was the most productive decade of Mackenzie’s career and began when he submitted some poems to the Endeavour Press, which led to his association with Norman. The chief aim of the Endeavour Press was to publish and promote Australian novels and poetry. Norman’s friend, P. R. Stephenson convinced Norman to be the reader for the new publishing venture and with the support of the Bulletin; the Endeavour Press was established in 1932. Norman read manuscripts and encouraged new writers, in the hope that the Australian market could support an adventurous publisher. Norman described his aims: ‘I’m not awarding myself any moral superiority when I say that when reading for the Endeavour Press, the only objective I had in mind was to find the quality in writing and creative ingenuity in the works I read, without giving any consideration to what might be their saleable qualities. The timing of the venture defeated it due to the effects of the Great Depression which was especially harsh in Australia and the market was small. The Endeavour Press folded after only two years. Thanks to Norman, Mackenzie was able to publish Our Earth as his first book of verse. The year was 1937, the Depression had officially ended but too many were still without a job. Norman’s offer to illustrate the poem meant that its publication could become viable. Mackenzie was grateful and the dedication to Our Earth reads: ‘To Norman Lindsay in sincere friendship and true esteem and gratitude’.